Written by Georg Holzmann on March 16, 2016 in Development, News. This app is a co-production with one of the best iOS developers out there: Martin Hering (Vemedio, Instacast, etc.). Many thanks Martin for your great work! Recording (left) and Waveform (right) view of the Auphonic Recorder iOS app. It is possible to choose between multiple microphones from your iPhone, an external USB interface, headsets, etc. and all default iOS pre-processing is deactivated to get the raw audio signal. The recorded signal is encoded in an uncompressed PCM or compressed AAC format, written to disk every audio buffer so that no data loss happens if the app gets killed. Another important use case of the Auphonic Recorder is to export audio recordings from an iOS device to the Auphonic Web Service. 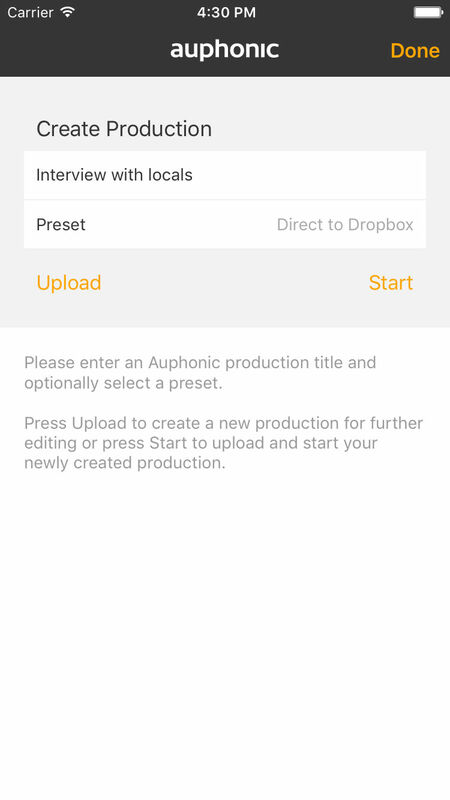 You can of course upload audio files in the background directly from the Auphonic Recorder to our web service, but it is also possible to export from other audio apps on iOS using the Share Action Sheet or Open In functionality of our app. For example, you might use Ferrite or Garage Band to cut and mix your recordings, then upload it to the Auphonic servers through our Share Sheet/Open In functionality. Select one of your presets to perform audio post processing (loudness, leveling, noise reduction), encoding/tagging and trigger publishing with one click directly from your phone. Auphonic export and upload screenshots. The Auphonic Recorder is a high-quality audio recorder with focus on ease of use, audio quality and stability. Record your raw microphone signals without any iOS pre-processing, in an uncompressed (PCM audio) or compressed (AAC) format, written to disk every moment to avoid data loss if the app gets killed. In combination with the integrated Auphonic web service, you can post-process, encode, tag and publish your podcasts, interviews, music recordings on the go with a single click. 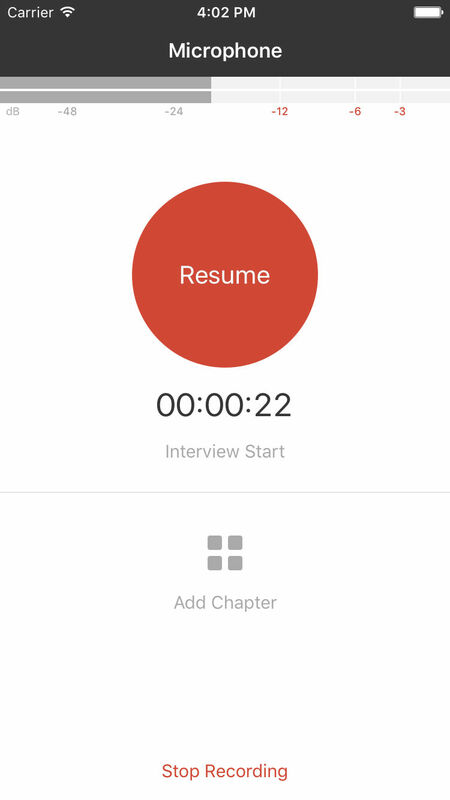 Our recording interface displays the current maximum peak level, you can add and edit chapter markers and it also records in background while using other apps. 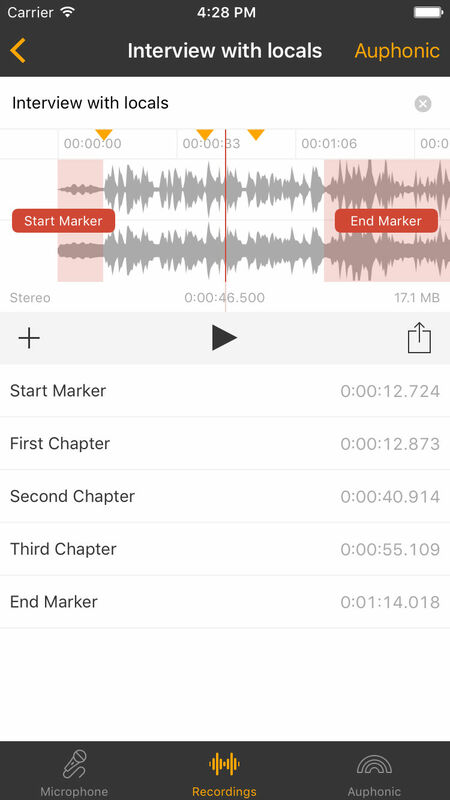 A simple editor shows the recorded waveform, where you can edit start/stop and chapter markers, export and process the audio file using the Auphonic web service or share it with other iOS apps. The app includes Share Sheet and Open In functionality, to import audio from other iOS apps and export it to Auphonic. Publish your results automatically via YouTube, SoundCloud, Podlove Publisher, Spreaker, Libsyn, Blubrry, Archive.org, Dropbox, (S)FTP, HTTP, Google Drive, WebDAV, Amazon S3, etc. Please note that you need a free Auphonic account to use our web service. All native recording, editing and sharing can be done completely offline without any account. Use our App, it's free! Please send us your feedback, bug reports and feature requests to ios@auphonic.com.